The American Red Cross provides relief to victims of disasters and helps people prevent, prepare for and respond to emergencies. The Minnesota Region serves 5.2 million people across Minnesota and part of western Wisconsin. Earlier this year Marian Krinke turned 104 ! gratitude and best wishes for reaching this milestone. We’d like to share our appreciation as well. And say Happy Birthday Marian! You’re a remarkable woman. Thank you for your service to the American Red Cross ! Emery has needed both blood and platelets during cancer treatments. You may be surprised to learn that you can play a direct role in helping patients kick cancer simply by donating platelets through the Red Cross. Take someone like 5-year-old Emery, who was diagnosed with acute lymphocytic leukemia last spring. During her intense cancer treatments, Emery has needed both blood and platelets. Cancers, such as leukemia and lymphoma, and certain types of chemotherapy drugs and radiation, can damage the bone marrow where red blood cells and platelets are produced. Platelet transfusions may be needed to prevent life-threatening bleeding and help cancer patients continue receiving lifesaving treatments. More than half of all platelet donations are given to cancer patients. Platelets are tiny cells that form clots and stop bleeding. About 2 million units of platelets are transfused each year in the U.S., and more than half of all donated platelets go to cancer patients. While cancer patients undergo treatment, a major side effect is low platelet counts. Without a platelet transfusion, cancer patients face life-threatening bleeding since platelets help blood to clot. The Red Cross needs your help to keep up with hospital demand for platelets. Because platelets must be transfused within five days of the time they are donated, there is a constant, often critical need for new and current donors to give. Please give platelets or blood. Appointments can be made using the Red Cross Blood Donor App, online at RedCrossBlood.org/Cancer or by calling 1-800-RED CROSS (1-800-733-2767). Invite family and friends to donate platelets or blood too. All blood types, except types O negative and B negative, are encouraged to give platelet donation a try. Type O negative and B negative donors are encouraged to give whole blood or a Power Red donation, where available. Did you or a family member receive platelets or blood? Let us know. Please contact Sue Thesenga at sue.thesenga@redcross.org or 651-895-7542 so we can consider sharing it for inspiring others to donate. Learn more and sign up to be a #CancerKicker at RedCrossBlood.org/Cancer. Red Cross flooding clean-up kits in Minneapolis. Photo by Jill Hallonquist. It’s officially “that” season as we unload Flood Clean-up Kits at the Minneapolis Red Cross office. Those pictured above will head to Carver and Scott Counties. More will go to Ramsey County and other places soon. Many more will stay here in our warehouse for distribution to individuals and our partners who will be helping others during this spring flood season. For example, we partnered with Scott County Emergency Management to open a shelter for people who evacuated their homes in a community in Jordan. Local Red Cross volunteers arrived quickly to set up cots and other shelter necessities. We’ll continue to be there until the need passes. Red Cross volunteers at the shelter for flooding evacuees in Jordan, Minnesota, March 15, 2019. Photo provided by Jennifer P.
This is going to be a huge response not only in Minnesota, but also in many parts of the country. To those fighting their own basement flood fight, we wish you strength and at least a little sleep here and there. We’re all in this together in whatever way we can help! By Jill Hallonquist, Disaster Program Manager, Twin Cities Area of the American Red Cross Minnesota Region. Click here for flood prep and response safety tips and resources. For relief assistance related to this disaster please call (612) 871-7176. Desiree with her son, Dylan, volunteering at Home Fire Campaign event in Marshall, MN. Photo courtesy of Desiree Haupert. When I listen to Desiree Haupert, a mom and volunteer, speak about her experience with the American Red Cross, I can hear the excitement in her voice as she tells her story about being fulfilled as she continues to give her time to the Red Cross. What started out as future planning to keep busy for Desiree in April of 2018 is turned into a lifetime rewarding experience. In her time volunteering at the Red Cross, she has been involved in many activities, such as Sound the Alarm by installing home smoke alarms and sharing fire safety tips in Slayton. During the flood in Tracy, Desiree also was involved in helping residents find shelter, food and additional resources that could support them during their recovery from the flooding. She also is involved with the Pillowcase Project, campaign that teaches kids in grades 3 to 5 how to prepare for home fire emergencies and other disasters like tornadoes and blizzards. As a duty officer, she takes calls for assistance requests, and then responds by reaching out to local Red Cross volunteers who give assistance to people who are affected by disasters. To top it all off, Desiree attends youth preparedness conferences to learn about engaging communities and provide support to them in the face of a disaster. This year Sound the Alarm takes place April 27 – May 12. On Saturday May 4, 2019, Red Cross volunteers and their partners will be installing free smoke alarms in Worthington. Join us! Click here to learn more about the campaign. 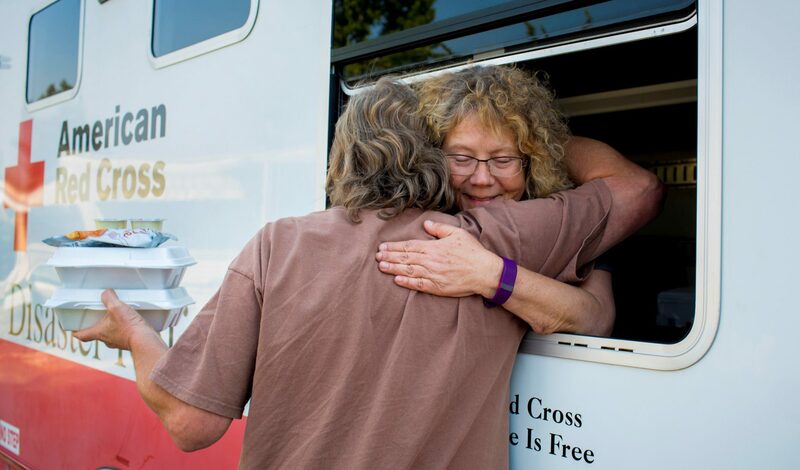 Click here to become a Red Cross volunteer. Every March we take extra care in celebrating the Red Cross mission to alleviate human suffering in the face of emergencies. One way you can join this effort is search within your community and find everyday people to nominate for our national Lifesaving Awards. Nominees are people who have used lifesaving skills, such as those learned in Red Cross CPR and First Aid classes. On average each year, more than 9 million people in businesses, schools and communities take Red Cross health and safety classes. Many put those skills to use every day. For example, on July 23, 2018, Meghan Knutson and Julian Meehl helped save the life of a young boy who was found unconscious in a pool at an aquatic center in Faribault, Minnesota. Together, they used their skills learned in Red Cross health and safety courses to save a boy until professional medical help arrived. Or take the story of Tom and Stewart: Why would you stop? Certificate of Merit, which is for individuals and off- duty professional responders. This certificate will be signed by the sitting President of the United States, a custom that began in 1913. Lifesaving Award for Professional Responders, which is for Red Cross-trained professional responders and healthcare professionals acting while on duty. Certificate of Extraordinary Personal Action, which recognizes individuals and teams who are not Red Cross trained. Nominate today to help and inspire others to learn important lifesaving skills that could save a life.